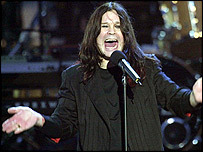 Rock star Ozzy Osbourne has made headlines for struggling with a burglar at his Buckinghamshire home. BBC News Online looks at the life of the singer and MTV reality show star. The burglary is the latest unhappy episode in what has been a turbulent couple of years for the singer. In December last year, he was critically injured after a quad bike accident in the grounds of his home. In July 2002 his wife, Sharon, was diagnosed with colon cancer, and Osbourne admitted he "fell apart" during her battle for health. She later made a full recovery. In February 2003 the couple's son, Jack, went into rehab after admitting a drug problem, while daughter Kelly was also treated for an addiction to painkillers. Sharon Osbourne later said she had left the singer for a time because of his use of alcohol and prescription drugs as he tried to come to terms with his son's problems. 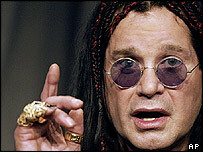 The singer revealed that the drugs had left him unable to walk or talk properly. He also told an interviewer he had been sexually abused as a child growing up in Birmingham. The family's private sagas have been played out in the full glare of the public eye following the huge popularity of the TV series chronicling their dysfunctional family life at home in Beverly Hills. Despite their trials, it has also been a period of momentous success for Osbourne and his family, who have been feted by world leaders and A-list celebrities. In April 2002 he was given his own Walk of Fame star in Hollywood. A month later he was having dinner at the White House as a guest of President Bush. He was further honoured by being asked to play at the Queen's Jubilee pop concert at Buckingham Palace in June 2002. As the of success of his MTV show grew, he signed a $2m (£1.14m) book deal. His family's fortune was put earlier this year at £40m (£23m). It has been an incredible journey for the 55-year-old dyslexic son of a West Midlands factory worker who had a juvenile conviction for burglary. He channelled his frustration - "I felt like a caged animal", he says - into his music. As Black Sabbath's front-man his excesses became the stuff of legend. Shocking even his colleagues, Sabbath sacked him in 1979... then the fun really started. Two years later he bit the head off a bat tossed to him on stage by a fan, claiming later that he thought it was a rubber toy. Not confining himself to mammals, he outraged record executives by also biting the head off a live dove during a meeting. Other topics for his memoirs include his arrest for drunken urination on The Alamo, taking acid tabs every day for two years with Sabbath's drummer, Bill Ward, and a stoned attempt to strangle wife and manager Sharon while on tour in Moscow. The police, their reaction unrecorded, were called. No charges were brought. 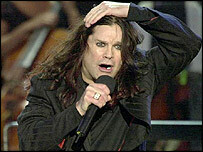 Osbourne has cleaned up his life, with rehab - including a spell at that palace of the dissolute, the Betty Ford Clinic. Sharon, to whom he has been married for more than 20 years, has proved herself to be an astute marketer of her husband's talents. His cod-satanic posturing, a pantomime dame counterbalancing Marilyn Manson's reptilian darkness, has brought him millions of new American fans, eager to see their icon on stage and to buy his records. His decision to donate the merchandising profits from a US tour to the families of police and firefighters affected by the 11 September attacks brought the former bad boy huge acclaim. MTV's The Osbournes had at its peak audience of eight million with America's TV Guide magazine describing the series as "a cross between The Simpsons and This Is Spinal Tap". The success of the first series led to a second for which Osbourne was paid a reported £13.5m. The rock star was at a loss to explain its popularity, and said: "I suppose Americans get a kick out of watching a crazy Brit family like us make complete fools of ourselves every week."